When you’re packed on an airplane full of passengers there are many reasons why you may feel uncomfortable. Maybe you don’t have enough leg room or there’s a crying baby in your row. When you’re soaring thousands of feet in the air, you may experience some altitude sickness. Although the cabin is pressurized to be safe for travelers, this altitude can translate to roughly 8,000 feet above sea level. For some, this can mean uncomfortable symptoms of altitude sickness. “The definition of altitude sickness is a reaction to the lower amount of oxygen at high altitudes due to lower air pressure,” says family physician John A. Joseph, II, MD. Dr. Joseph sees patients at the Scott & White Killeen Clinic and offers some tips on how to stay healthy while flying. Why do I feel sick when flying? At higher altitude, and lower air pressure, air has less oxygen per breath. At higher altitude, and lower air pressure, water evaporates faster and the air is dryer. When you’re flying in the air, you’re at a higher altitude and so you may experience some irritating symptoms. Why am I always the one to feel sick, when everyone else seems fine? If you have medical concerns, you may be more at risk for an uncomfortable flight. Also, for unknown reasons Dr. Joseph also says that passengers between the ages of 16 and 25 seem to be more often affected by flying. What can I do to avoid feeling sick when traveling? Hydration—Remember to drink plenty of water before flying, even if you tossed your liquids at the security checkpoint. Avoid alcohol and caffeine which can lead to dehydration. Get Up and Stretch—Especially on long flights, walk around the cabin and stretch the legs. “This also decreases the risk of developing clots in the legs, also known as deep vein thrombosis or DVT,” says Dr. Joseph. Consider Medications—Some medical providers recommend taking anti-inflammatory medications such as ibuprofen about 30 to 60 minutes before the flight to decrease the risk of headaches and muscle aches. Rest—When traveling there are lots of things to remember last minute. You may be tempted to stay up late packing or finishing last minute arrangements. But to help avoid plane sickness, get a good night sleep before travelling. Can my doctor recommend anything before my trip? Dr. Joseph is passionate about travel and helps to prevent altitude sickness for patients. He plans to travel overseas this summer for the World Cup and is an avid scuba diver. He is well aware of the risks of altitudes and provides specific recommendations before his patients travel. Talk to your doctor if you’re nervous about flying. 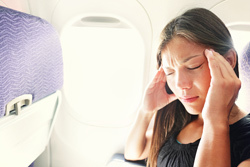 If you often become nauseated or fearful on flights, your doctor may be able to prescribe medications that can help. For more info, The Centers for Disease Control has health advisories for travelers including area-specific health risks and recommended immunizations. We wish you all happy travels and want to know what works for you! What are some things you’ve done to avoid plane sickness? Wellness	Do you have an unhealthy work/life balance? Wellness	Achoo! What are pet lovers supposed to do?